Carmen DeSousa: LAND OF THE NOONDAY SUN, a Romantic-Suspense Bestseller is only 99 cents this week only! 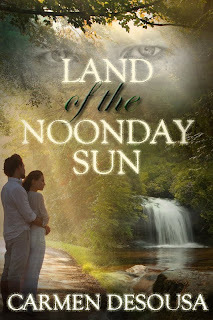 LAND OF THE NOONDAY SUN, a Romantic-Suspense Bestseller is only 99 cents this week only! Land of the Noonday Sun is a romantic-suspense bestseller on Amazon, and this week only, you can download it for only .99 cents in celebration of my new novel, Entangled Dreams, which releases in a few weeks. Both of my published novels, She Belongs to Me and Land of the Noonday Sun, have reached bestseller status right alongside Nicholas Sparks, J.D. Robb, and other great authors. My third novel, Entangled Dreams, is available now. When Alexandra's choices dissolve into Entangled Dreams, pushing her down a dark and dismal path, she must trust her instincts to escape danger, but be able to surrender all to find her happily ever after. Knowing how to decipher the difference, will be her toughest challenge.